Back in the 50s, the mother-daughter matching fad was in full swing... but who knew it was this easy to create the look? 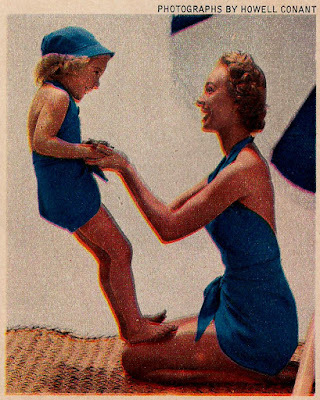 Woman's Day showcased a number of real swimsuits that you can make from simple shapes for ladies and their cute kiddos. Many of these looks are sarong style swimsuits, meant to fit and feel almost like a sun dress, and would have been made from woven cotton (without any stretch). 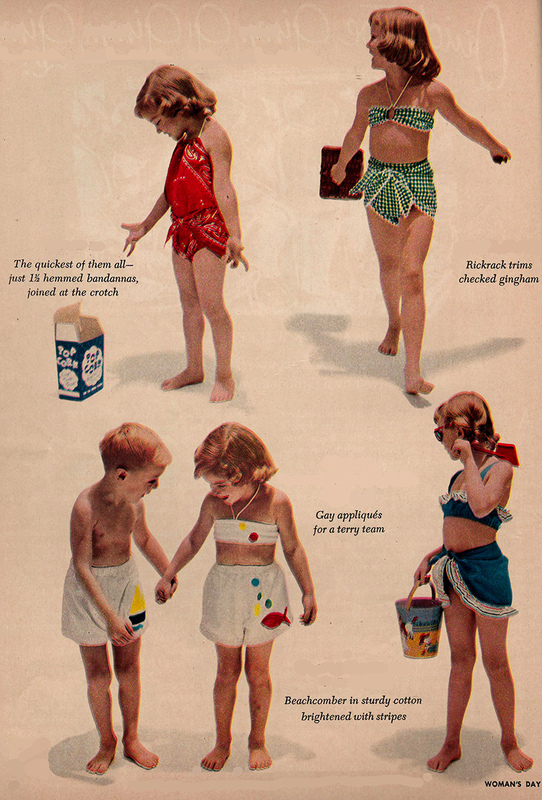 Stretch cotton blends were in their infancy in the 1950s. Stretch cotton fabrics first showed up in sportswear, but not until later in the decade. 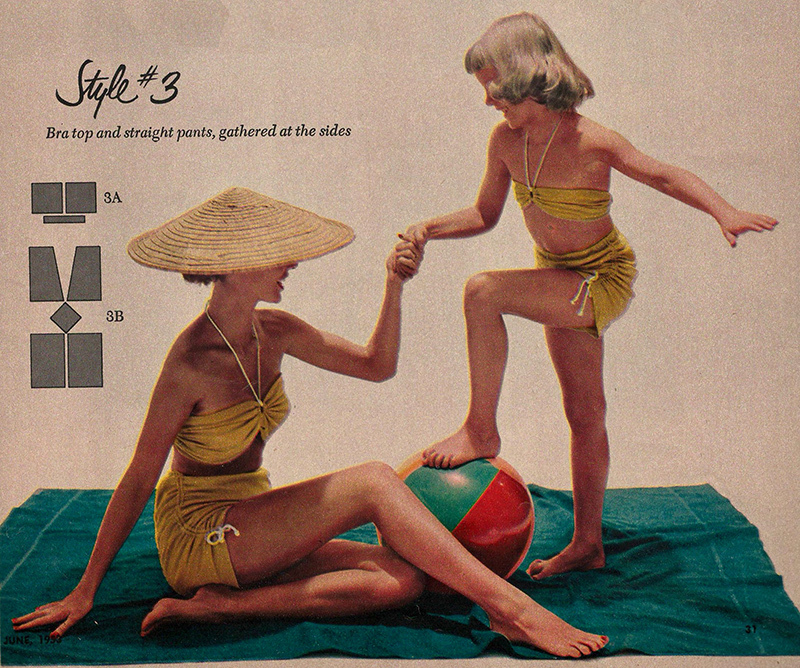 The easy-to-sew trend was a winner back in 1953, as evidenced by these adorable photos. 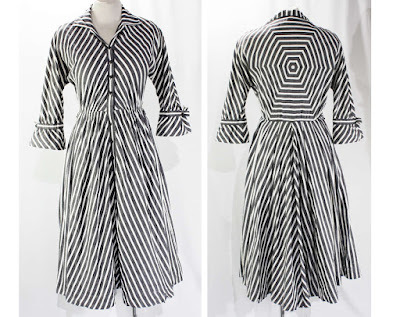 Here's a one-piece halter suit with skirt style wrap made from four simple pattern pieces (shown above) that can be printed and enlarged to fit your dimensions, or your daughter's. Next, an all-white 1950s bikini made of Everglaze crinkle cotton. The pattern pieces are slightly altered triangles in a diaper-wrap made popular by Claire McCardell in the 50s. 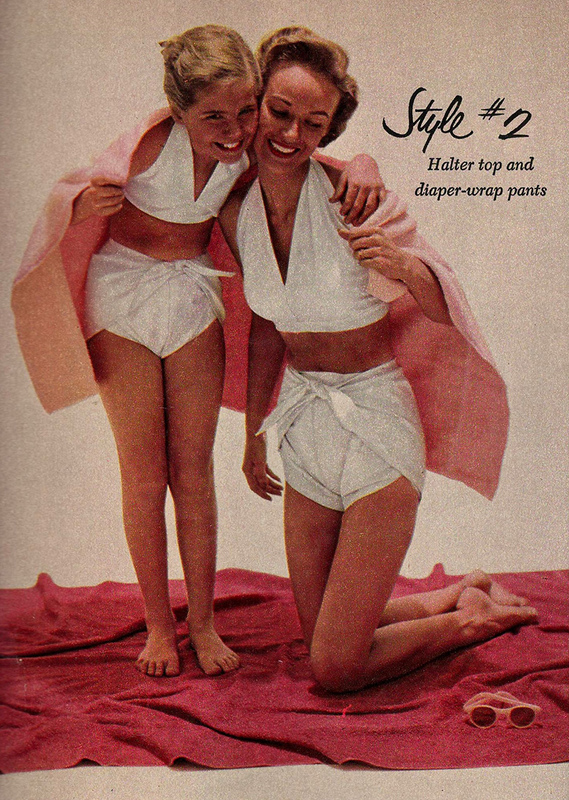 The word "diaper" mentioned here has nothing to do with babies, but refers to the overlapped design of the bottoms. On this set, the one-piece design has been cutaway into a two-piece bikini style. These pattern pieces are almost modular in this sense... definitely inspired by tiki styles from Polynesia. 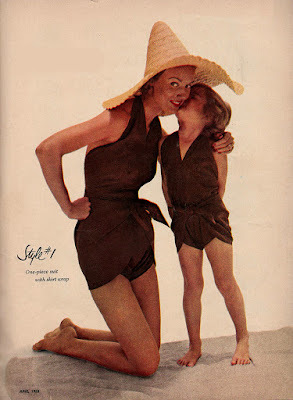 And here's another look borrowed from Claire McCardell, including a bandeau bra top and simplistic shorts, gathered and tied at the sides. Both the design and the chartreuse color of this bikini is classic to 1953. And oh-my-goodness, cuteness galore in these wee swimsuits for the little ones. The bandana print is actually made of two Western style scarves, seamed once and tied halter-style at the neck. Ready for some sun & fun! 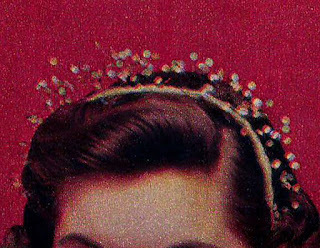 Can't find a vintage tiara that suits you? Here are four (with directions on how to make them) courtesy of Woman's Day Magazine circa 1953. Materials: 1 yard of 5/8" pale-green grosgrain ribbon; about 12 dozen pastel-colored sequins; milliner's plastic bicycle clip; 1 spool bead wire: household cement. Twist wire to make about 20 twigs with three "branches" and one "stem", each 1 1/2" long in total; twist wire to make 15 twigs, each 2" long and with 4 side branches. Leave loop for sequins at end of each branch. Wrap bicycle clip with ribbon, catching stem of 1 wire twig with each twist of ribbon. Bend end of wire around clip. Use the larger twigs across center. Tack ribbon at each end of clip. Cement a sequin to each loop on twigs. Materials: 14" of 1-inch silver braid; about 2 dozen blue stones; about 2 dozen rhinestones, cement-on kind; 14' of millinery wire; 2 small side combs; 4" of round elastic; household cement. Join ends of millinery wire, making 13" circle. Sew ends of braid together to form 13" circle. Whip to wire base. 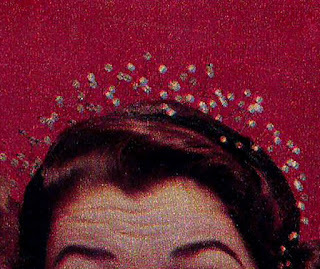 Spacing evenly, cement stones around tiara. 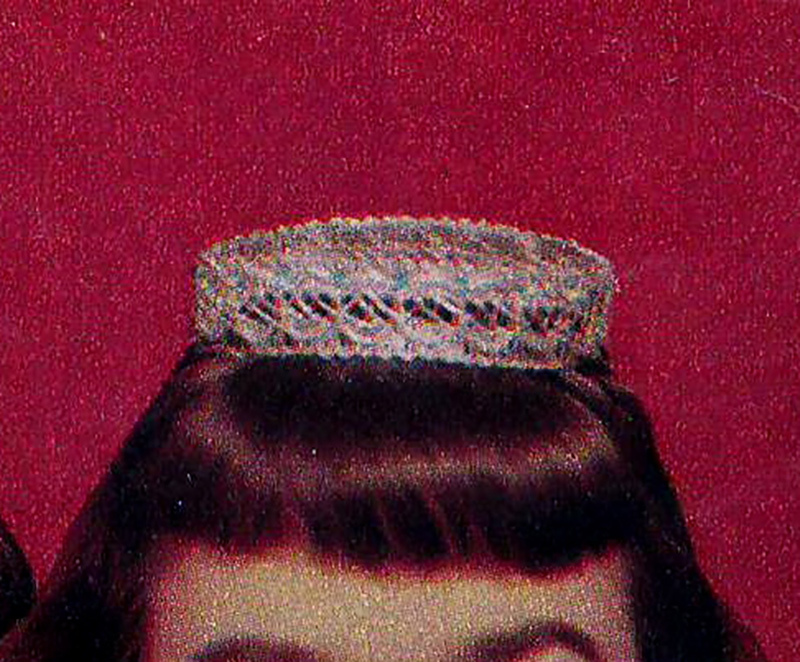 Center 2" of elastic along top of each comb; sew in place, and tack ends to inside of tiara, one comb on each side. Materials: 2" x 13" piece of white felt; 14" of red velvet cording; 14" of millinery wire; 24" of bead wire; about 300 seed pearls; white cotton thread; 11 rhinestones, cement-on kind; 2 small side combs; 4" of round elastic; household cement. 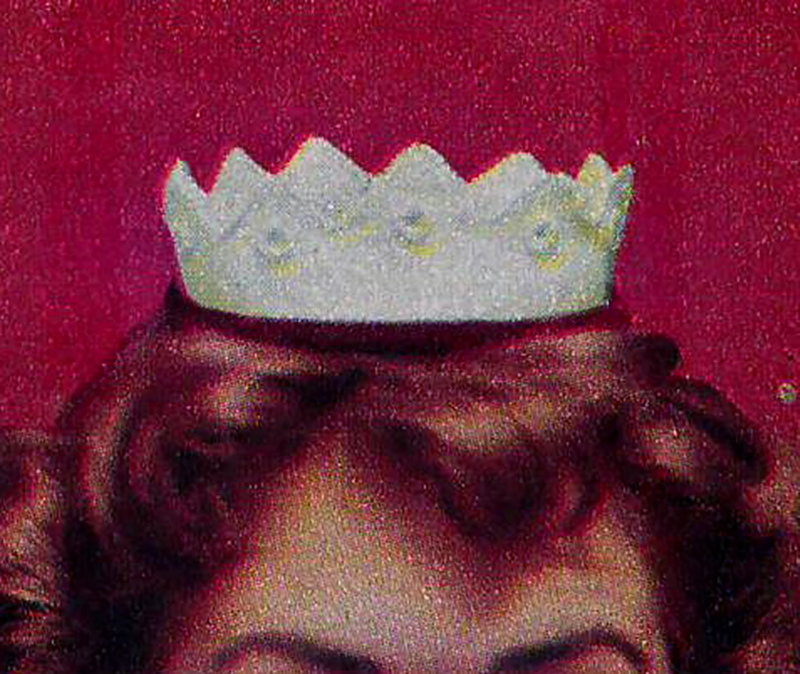 Cut felt in shape of crown, making 11 points and graduating them from 1" high at center back to 2" high at center front. Measure bead wire to fit along pointed edge of felt; add 2". Whip in place. String pearls on bead wire; twist ends of wire together. Cement rhinestones 3/4" below center of each point. String 10 pearls on white cotton thread; knot ends together to form a circle, and tack circle around a rhinestone. Repeat. Run millinery wire through velvet cording; join ends to form 13" circle; whip to base of crown. 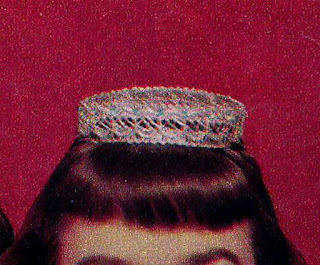 Center 2" of elastic along top of each comb; sew in place, and tack ends to inside of tiara, one comb on each side. Materials: 1 yard of 5/8" black grosgrain ribbon; about 12 dozen rhinestones, cement-on kind; milliner's plastic bicycle clip; 1 spool bead wire; household cement. Follow directions as above for Sequined Tiara. 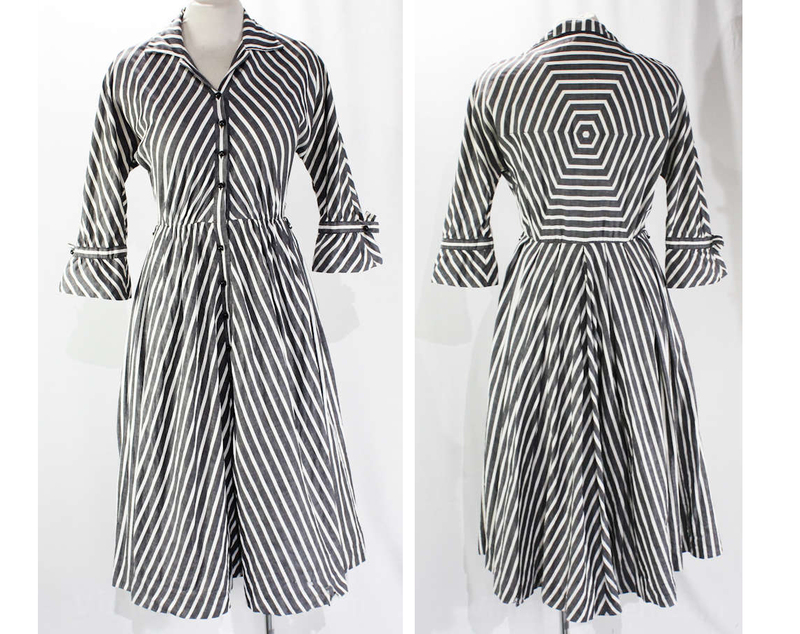 What comes around goes around... have a look at this Serbin shirtwaist dress in striped cotton chambray, made in the late 50s with a fantastic spiderweb style design. And here it is again! 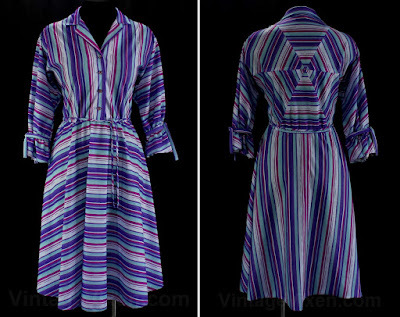 This time it's a 1980s version, nearly a line for line copy in synthetic knit from J.J. Dean of California. Designers have always borrowed from the past, and they still do. 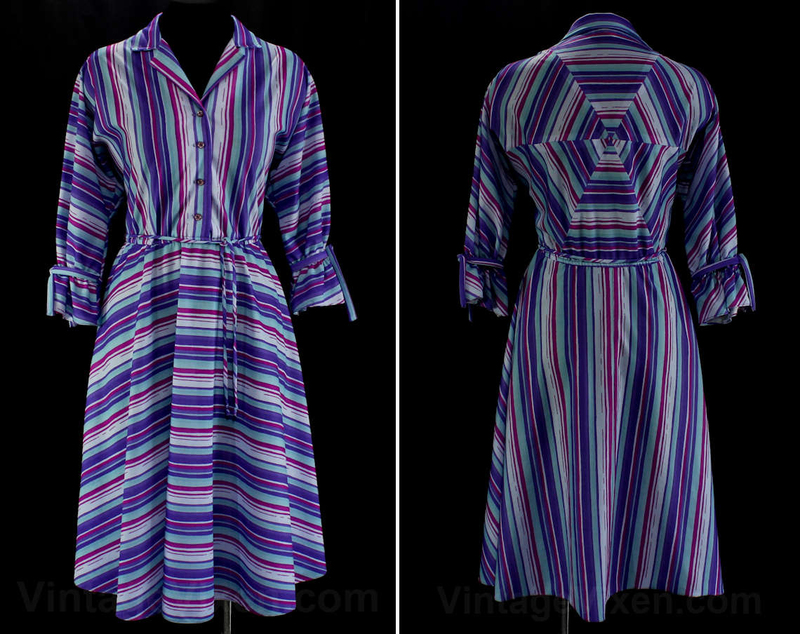 Our huge vintage clothing collection is a treasure trove for inspiration!